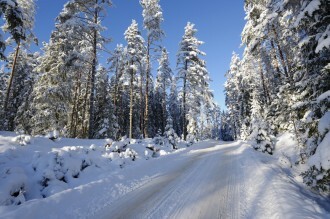 Resuming Winter Driving Safety Tips to Protect You & Your Passengers (Pt. 1), below we will continue to point out some important things you can do to keep yourself and your family safe this winter season. While the first part of this blog series focused on some general winter driving safety tips, here, we will highlight some winter driving safety tips that can be helpful when people may be driving long distances this winter. These winter driving safety tips can protect you and your family if you end up taking a longer road trip this winter season. Always check the weather first – Regardless of whether your trip is spur-of-the-moment or is an adventure you’ve been planning for some time, be sure to check the weather for the time that you will be on the roads. If the forecast threatens some bad weather, consider putting your trip off until the weather conditions improve. If, however you can’t do this, make sure to let your loved ones know your route, when you are leaving and your destination/expected time of arrival. Ensure your vehicle is in optimal condition prior to getting on the road – The winter roads can be rough on vehicles. When these vehicles may not be in good working order, the rough conditions of winter roadways can end up causing frustrating or even dangerous complications with a vehicle’s ability to function. From causing you to be stranded in the snow on the side of the road to causing essential equipment to malfunction while driving, these problems can be devastating. So, do your best to avoid them by having your vehicle checked out before you hit the winter roads. Pack some essentials – You never can tell what winter driving may bring you, so make sure you are prepared by bringing some essential equipment with you. Some of these important items include (but are not necessarily limited to) your cellphone and a backup charger (or a backup battery), blankets, gloves and hats, water and maybe even extra medication that you or your passengers may need. We will point out some final essential winter driving safety tips in the upcoming conclusion to this blog series – be sure to look for it! Have or someone you love been injured in any type of motor vehicle accident? If so, it’s time to contact the Littleton car accident attorneys at Bahr and Kreidle. Since 1983, our trusted and dedicated lawyers have been fighting on behalf of injured people and aggressively standing up against injustice, inequality and intolerance. At every stage of a case, our attorneys are dedicated to providing our clients with exceptional personal service and the highest quality legal representation. This means that our clients can always count on us to be available to answer their questions, to fiercely defend their rights and to be tenacious about getting them the justice and compensation they deserve.